U.S. Sen. Roy Blunt meets with reporters in Clayton. “I’ve seen all the vehicles that were at Ferguson,” Blunt said. “They were generally under Homeland Security. I don’t know if any of those vehicles had anything to do with military surplus. They were all defensive in nature. But if you’d looked at some of the coverage on this – the national coverage – you’d assume there were tanks and handheld weapons that nobody could get their hands on. “Neither of those things are the case,” he added. Blunt spent the afternoon with local law enforcement in Clayton, including officials with the St. Louis County Police Department. The equipment that the agency used during protests sparked an international outcry – and hearings into whether it was appropriate to give local departments military equipment. U.S. Sen. Roy Blunt speaks to reporters in Clayton about his discussions with law enforcement personnel. But Blunt said most of the equipment that local agencies get is communications-related, which became a priority after the 9/11 terrorist attacks. The Humvees or BearCats that bigger departments receive, he said, can be critical in emergency situations. “What local police wear and when they decide to put it on or what kind of equipment they need is probably not something that is best decided in Washington, D.C.,” he added. Gabe Crocker of the St. Louis County Police Association was at the meeting with Blunt. He said he "was really glad that someone from the national political scene" was willing to meet with local law enforcement "to discuss our equipment and discuss tactics so that he would be more informed when it came to public policy or lawmaking." "I don't think it's unreasonable for this large metropolitan area to have vehicles that allow our tactical officers to respond to a wide variety of situations," Crocker said. "I would never want to be the politician who disarmed local enforcement from being able to properly respond to a school shooting where we're not able to rescue school children that are stuck in a building because politicians that live most of the year in Washington, D.C. thought those vehicles looked a little too scary." Blunt said he had “secondary” discussions about the renewed protests in Ferguson, which have resulted in arrests and placed law enforcement agencies under further scrutiny. But the main topic of discussion, he said, was law enforcement equipment. 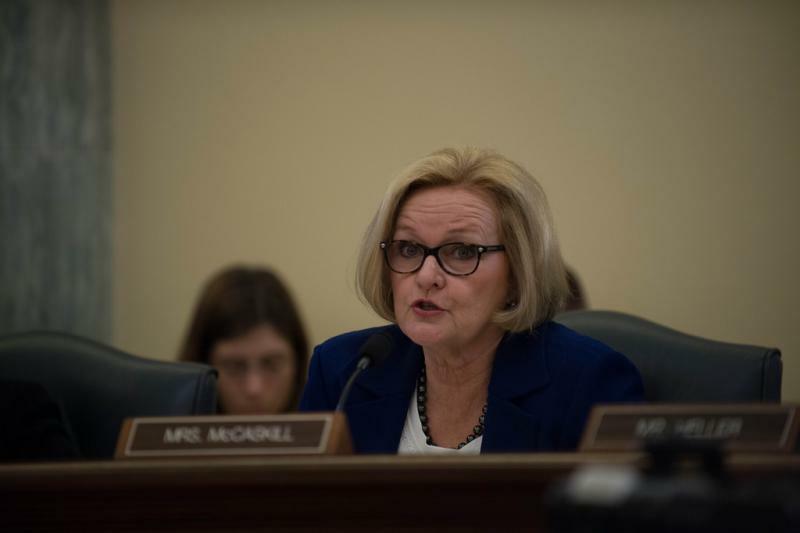 Armed with a "laundry list of questions," U.S. Sen. Claire McCaskill, D-Mo., will lead the Senate Homeland Security Committee Tuesday in a hearing to examine the militarization of local police departments. The hearing follows public outrage over what some saw as an excessive police response to protests in Ferguson following the shooting death of an unarmed black teenager by a white Ferguson police officer. Three different federal departments have programs to help local police departments acquire military-type hardware, including armored vehicles, and tactical gear and weapons. More than one-third of the military equipment deemed surplus and made available in the Defense Department’s so-called 1033 program was either new or unused according to information provided Tuesday to the Senate Homeland Security and Government Affairs Committee. Representatives from the departments of Defense, Homeland Security and Justice faced sometimes pointed questions about waste, weak oversight and almost nonexistent coordination among the programs their departments administer to help local police departments gain access to military equipment. It’s been roughly 45 years since Patrick Howe served in Vietnam. And he’s been waiting that long to receive his Purple Heart for the wounds he sustained in battle.